Would you vote for a guy who planned to surround himself with like-minded people who’d run the state like a machine? A man who’d pick fights with big oil, big pharma and Wall Street? A man who’d shrug off divisive issues –like abortion, stem cells and gay marriage– and focus on poverty, jobs, redistribution, and class? Would you vote for a firebrand, a demagogue, a populist, a leftist tyrant? Who you vote for someone who’d bend the rules to make the country a fairer place for everyone? And, what if he wasn’t perfect? What if he’d had affairs with a number of women, or embezzled a lot of money, or been kicked out of college for cheating on exams? Would you give up on him or vote for him anyway? Long was called “the Kingfish” because he ran Louisiana like his personal empire. He filled the statehouse with his own people and ran roughshod over the rich families in Baton Rouge. The big money folks hated his guts, and for good reason. Wouldn’t you like to vote for a guy that was hated by big business, hated by the 1 percent, hated by Wall Street? Wouldn’t you like the chance to vote for someone who was willing to take them all on; someone who’d promise to re-regulate the system and tax the hell out of every billionaire fatcat in America? Right on. What politician has the courage to say that today? FDR was afraid of Long and tried to make it rough on him. He had him investigated by the IRS, but the investigation turned up nothing. Long was adamantly opposed to the Federal Reserve, foreign wars, and the massive concentration of wealth held by a few billionaire bankers and industrialists. Smart guy. He knew that Americans love socialism; they just don’t like the word socialism. It sounds “foreign” to them. Roosevelt capitalized off Long’s populism, but then tried to destroy him. Long was assassinated on September 8, 1935 at the State Capitol by a lone gunman. He was planning to run for president against Roosevelt. He was 42 years old when he died. Long has been vilified as a powermonger and a demagogue. He had his shortcomings, but his devotion to working people was never in doubt. He was a tireless fighter for the little guy and he made life miserable for the big shots. Gonna be run by little folks like me and you. 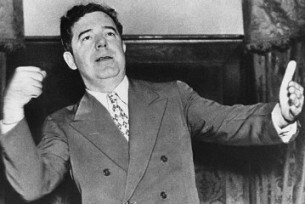 We could use a guy like Huey Long today.